There is a strong push in Sydney to preserve traces of architectural heritage throughout the city. For architects, this both poses challenges and provides benefits. Surry Hills is one suburb where this heritage aspect is particularly pronounced. As a former industrial district and the old heart of Sydney’s rag trade, and as the current home to a broad demographic of majority upper-class residents, there is a real tension between past and present when contending for the future. When design firm MHNDU was originally commissioned for a multi-residential development on a prominent corner site of Devonshire Street, they knew they needed to find a way to reconcile this tension. When the project’s scale increased significantly as a result of their client purchasing the adjoining site, this need became still more pressing. MHNDU worked closely with the City of Sydney for the initial design schematics. As a result, a warehouse-influenced style of architecture was chosen for the project. Specifically, the architects looked to the design of the old 20th-century, pitched-roof hardware store that had formerly occupied the site. 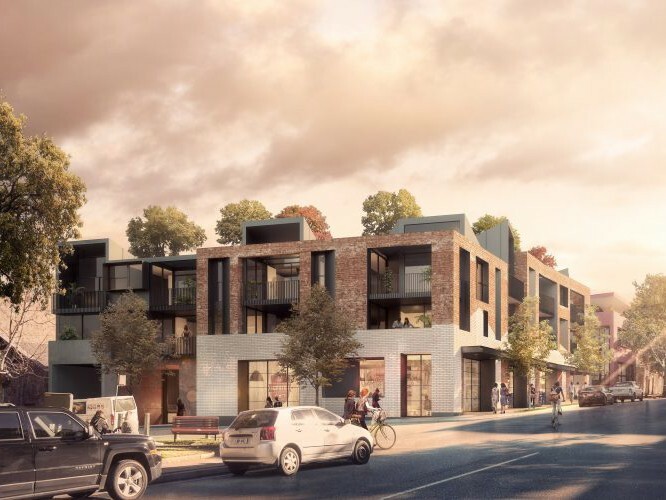 Although it wasn’t possible to include the hardware store into the final 20-apartment development, the architects decided to incorporate the silhouette of the store into the brick façade. A “trace” of the former building is to be recreated within a pattern of glazed white bricks and red recycled bricks, thereby preserving “the memory of the hardware store that once presided over this corner”. The heritage of the area is further referenced through the window design. Surreptitiously, the Victorian terrace-inspired configuration of dormer-style windows nestled into slate roofs will also work to draw light deep into the floorplan. “Not surprisingly, given the locale, there is a strong industrial aesthetic in this development,” reads a statement on the architect’s website. “However, while the apartments are aligned to the edge of the pavement below, there’s also an internal communal courtyard, with partially opened corridors benefitting from the views to the garden. The Devonshire Street development – the construction of which is anticipated for later this year – has been shortlisted for a 2017 World Architecture Festival award in the ‘Future Project – Residential’ category.